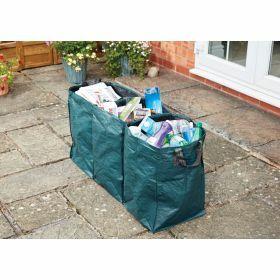 A very useful set of 3 woven bags made of tough, durable wipe clean fabric and held together if needed by Velcro to use for transporting your recycling, your shopping or for your storage needs. Keep them open for use or fold them up for storage. L13" x W13" x H19".